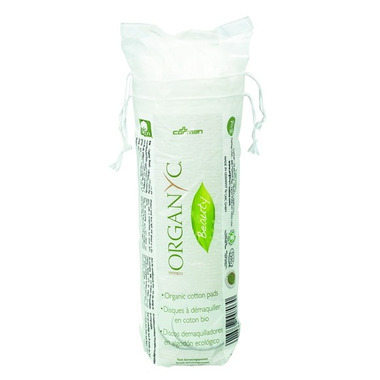 Organ(y)c's fabulous Cotton Wool Pads are made from 100% organic cotton and have NO nasty chemicals added. These super soft cotton pads are perfect for removing your daily make-up and applying your facial toner. They come in a biodegradable and compostable packaging. Soft and nice size. Good for baby and has a nice drawstring top to keep clean and tidy. Doesn't stand up to scrubbing but good for wiping. I've reordered many times. On sale it is a great purchase - I use to to remove eye makeup and nail polish. Repurchased these because they are nice and soft on my face. I cut them in half so I get double the use out of them. I like to pick these up when they're on sale because they are good quality, although a bit pricey. Very soft to the touch! I use these with micellar water to remove makeup. They are soft on the eyes and do a good job. They're really smooth on the skin and of great quality material, but since you have to throw them out after one use it's not really great for someone who wants to reduce their consumption. I had not thought of that before purchasing them! These are perfect. I use them for applying toner and facial oils. I would repurchase. These are the BEST cotton pads out there and it's a bonus that they're organic! They are the strongest ones I've come across, they don't pull apart like ones you get from the store. They are a bit pricey especially since it's a small package, but it's worth it! I spent ages finding a cosmetic pad that was not tested on animals. Not only is this not tested, but the packaging is recyclable as well. It's fabulous, soft and gentle on the skin. I won't be buying any others. These are such great cotton pads! I love that they're made from organic cotton, and they have such a nice feel to them - no little fluffs coming off all over the place, but they're still very soft. I cut each cotton pad into four and store them in a jar in the bathroom to save money and cut down on waste, and they hold up incredibly well after being quartered! Best cotton pads ever! Very soft, yet very strong and durable. They don't fall apart and leave no fluff on your face. You won't be disappointed! Very soft durable cotton pads. Very nice cotton and they hold up. Great value, great product! All cotton, all natural, and they don't fall apart compared to other store brands that are NOT entirely cotton. Even the packaging is biodegradable, which is very appealing. Every Organyc product has been amazing. I'll never go back! Soft and yet doesn't fall apart at all. For 100% organic with such quality, it's great value. Too small for using as a toner application for which I purchased them. Otherwise soft and clean - - I liked that they were organic just wished they were bigger. The best I've used. No shredding at all. I am very happy to have found this product. Excellent quality - the cotton doesn't fall apart like others I've used .... PLUS, they are 100% organic .... and all this at a low price!! These are great. No fibres or anything..Highly recommend! These pads won't leave bits of string or fluff sticking to eyelashes or face. That's all that I ask for. Absolutely amazing product. I will never buy another brand unless I really have to. These are the BEST I've ever used. They don't fall apart or shred when wet plus the price is reasonable. Quite sturdy but very soft. The best organic cotton pads I've ever used. So soft and perfect. I really love these! The fact that they are organic makes it so much better. I will definitely order these again. Soft and nice, love it! super soft!! great on sensitive skin. Definitely will buy it again. Feels very good on my sensitive skin. They don't fall apart and they are soft. Very happy with them. Love these because they are organic ! These are great. They don't fall apart like most of the others. These are great make up remover pads. This is the first time I tried them, I will buy them again. These are great. I was previously using a cheap department store brand, and they left cotton pieces behind. These don't fall apart and they're very soft. Very happy with this product. These are great... they don't crumble like other cotton pads. Been looking for organic cotton pads like these for a while - very happy with their texture, size & durability - and the packaging is eco-friendly too. Will definitely buy again! So much nicer than anything similar I've found. They stay together extremely well (I use both sides to remove my makeup and they don't show any signs of wear) and are very soft. I also love the biodegradable packaging! I'm switching to these for good. Durable. Don't fall apart when using them and nice and soft. These are great. They do not disintegrate at all and are soft. They're the perfect size for toner (not too big). I love that they are natural.